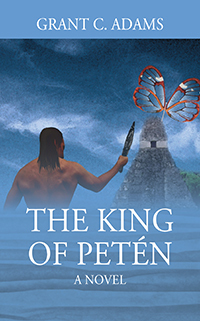 Chris Thompson, a college professor, and David Castillo, a native Guatemalan find themselves trapped in seventh century Mayan civilization in the Tikal region. They experience wars and death, betrayals and forbidden relationships. They learn to live and adapt to a time period drastically different from their own. The two friends realize that they are capable of doing unimaginable things, even kill — they will do anything in order to survive. With decisions that alter the lives of others, Chris and David discover their importance among the Mayan people. Tikal’s history is at stake. Grant C. Adams did his undergraduate and graduate studies at California State University, Sacramento. He majored in Spanish with an emphasis in Hispanic American Literature. He lives in Rocklin, California with his wife and three daughters. His website is www.grantcadams.com. The image used for the book cover was created by Anna M. Kerr-Carpenter. ¡Muchas gracias!